Krokos Kozanis PDO or Greek saffron is known for its particularly high quality colour and strong flavour. Used for various purposes, the harvesting, drying and packaging is done according to a very specific know-how that can be traced back to ancient times. The crocus (or krokos flower) that produces saffron was already harvested during the Minoan period (from 2,600 to 1,100 BC). 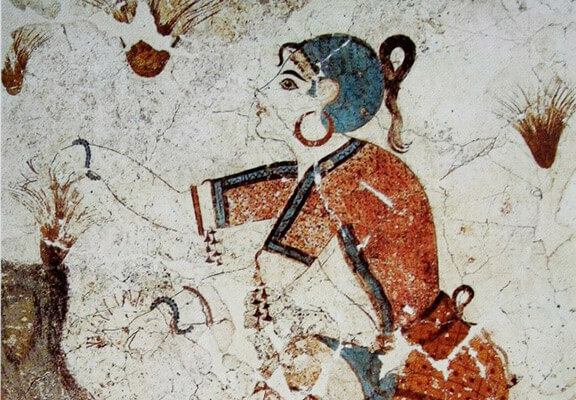 The ‘Saffron Gatherer’, a painting dating back from 1,600 BC, shows a young woman gathering saffron, reflecting its importance already at the time. In addition, krokos, the flower and the saffron itself, is referred to in the earliest texts of literature such as Homer or the Old Testament, as well as in Greek mythology. Hermes (son of Zeus, messenger of the gods, god of trade..) was playing disc with his good friend Krokos, a young mortal. However, the Greek god fatally hit Krokos in the head. As he fell to his death, three drops of blood fell in the centre of a krokos flower, forming the three stigmas, which constitute the saffron. Today Greek saffron comes exclusively from the Kozani region. Cultivation in that area dates back from the 17th century, offering a unique combination of specific climatic and soil conditions (drained soil of medium fertility with a warm temperate climate), paired with the specialist knowledge on growing and harvesting the plant results in a product of high quality. Krokos flowers begin to appear mid-October for 20 to 25 days. The harvesting consists in picking up the flowers by hand from sunrise almost to sunset, delicately piling them into aprons or baskets. The picked flowers are then put on a special table, and with the help of an electric fan, the stamens and stigma are separated from the rest of the flower. The most important and delicate part is the drying, requiring great care and skill. If not done properly, the quality and distinctive properties of the spice can be altered. The fresh stigmas are laid out in thin layers on frames with a silk base. These are then put in well-ventilated heated rooms. This work, all done by hand, lasts between 20 to 60 days. Once dry, the stamens need to be sorted and cleaned, and put in containers for delivery at the cooperative. All this work should be finished by the end of March. Once delivered at the cooperative, the saffron is checked especially for the moisture level due to the danger of fungal proliferation, which could then deteriorate the product. The moisture level should not be greater than 8 to 11.5%. Additional checks are needed to ensure that there are no foreign material or to see if the quantity of pollen is not too high. Once it has passed all the checks, the saffron is packed. When used as seasoning, it is usually packed in one, two, four and 28 grams. However it can also be sold in smaller quantities in powder form – from 0.25 to one gram. Mainly used in cooking, saffron can be used in small quantities due to its powerful flavour. It is often used to perfume rice, and to accompany fish or chicken for example. Nonetheless, its distinctive colouring power, particularly strong for Krokos Kozanis, enables to be used in the production of paint or dying clothes. Due to its therapeutic attributes, it can also be found in cosmetics or pharmaceutical products.